The Suffolk County SPCA is offering a TWO thousand dollar reward for information leading to the arrest and conviction of the person responsible for abandoning a male. 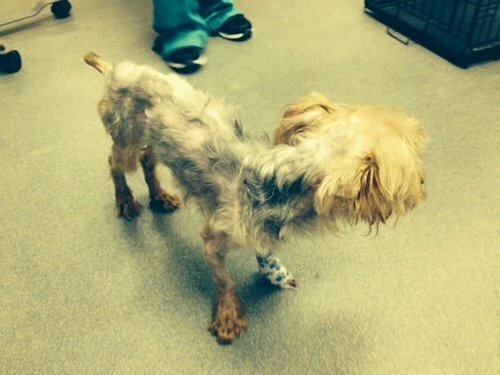 Brentwood, NY - December 24, 2014 - The Suffolk County SPCA is offering a TWO thousand dollar reward for information leading to the arrest and conviction of the person responsible for abandoning a male silky/Yorkie Terrier-type dog in Brentwood. The SPCA was notified Sunday that the dog was found in a cage on the side of Candlewood Rd and was covered in feces and urine and was extremely matted. Chief Roy Gross of the Suffolk County SPCA said that the dog was brought to a 24 hour Veterinary Hospital where upon further examination it was found to be emaciated and had open sores on its body. The dog's weight was only 4.6 lbs, according to Gross. It needed aggressive medical attention to save its life, as it was near death. Subject: LongIsland.com - Your Name sent you Article details of "Suffolk County SPCA Offers A $2,000 Reward for Information on Abandoned Dog"